UV rays can not only damage your car’s interior, but the eyes and skin as well. Keep yourself and your loved ones safe from the harmful effects of the sun’s rays using the PROSHADE Safety Plus sunshade. Our special UV resistant technology keeps your car cool and comfortable on hot sunny days. Don’t let yourself get burned! Depend on PROSHADE to keep you and your family safe. When you insert a PROSHADE Safety Plus sunshade into your car’s windows, you are protecting it against light and heat damage from the sun. No more cracking! No more fading! Keep the interior of your vehicle looking and feeling like new and feel confident that your investment is protected with PROSHADE. Competitors cut corners and typically make sunshades that are hard to apply, and even more difficult to remove. Stop fussing with straps and suction cups and switch to PROSHADE. Our unique Static Cling technology makes for easy application and easy removal. Don’t waste time buying and trying inferior competitor sunshades. 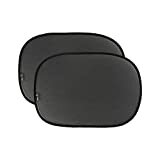 Simply stick on the window and be on your way with the PROSHADE Safety Plus sunshade. Our designers wanted to ensure that the PROSHADE Safety Plus sunshade was useable in every vehicle. That’s why we created it to fit in a wide variety of cars: including Vans, Trucks, Compact Cars, and SUVS! We advise our customers to measure their windows before purchasing to ensure the perfect fit. Our shades are easily adjustable and incredibly versatile. PROTECTION: Keep your car cool and comfortable on hot sunny days. Our specially designed UV sun shade keeps the interior of your vehicle cool and your skin and eyes protected! DAMAGE RESISTANCE: Our UV shade protects your investments! Inserting our sun shade in the windows of your vehicle protects your car from UV damage. No more cracking and fading! Maintain the integrity of your vehicle’s interior! EASY TO USE: Our sunshade is easy to use! Competitor’s sun shades can be hard to attach and assemble. Our sun shade uses Static Cling technology. Just press it onto the window and you are ready to go! GREAT FIT: Easily adjustable and incredibly versatile! Fits well in Vans, Cars, Trucks, and SUV’s. We advise that our customers measure window’s before purchasing! MONEY BACK GUARANTEE: We guarantee that you’ll love the way that the ProShade makes your vehicle look and feel! Buy now while the price is low and feel confident in your purchase! Never worry about your vehicle getting too hot again!